She's an outspoken cultural activist and feminist and recently starred in the police shooting drama The Hate U Give. 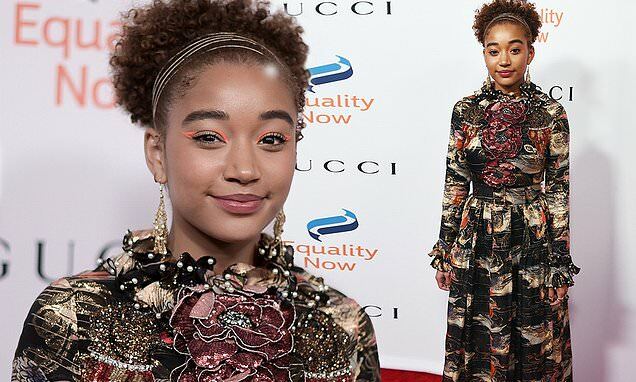 And on Monday night, Amandla Stenberg was a special guest at the annual Make Equality Reality Gala in Beverly Hills. The 20-year-old was the recipient of the Changemaker Award at the fundraiser for the nonprofit Equality Now. Stenberg chose a colorful outfit for her big night, stepping out in a long-sleeved, full-length gown. The outfit had a ruffled collar and flared cuffs and was belted at the waist. She wore a headband over her curls and added dangly earrings. The rising star was made up with orange eye-shadow and red lip color. Black-ish star Tracee Ellis Ross was also at the gala where she posed for photos on the red carpet with Stenberg. The actress daughter of superstar Diana Ross looked sensational in a black gown decorated with a large colorful motif.